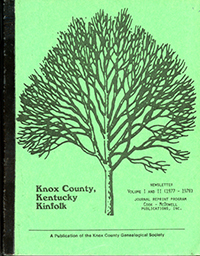 Biographical Supplement to Knox County, KY: History and Families, No. 1: James M. Arthur, Martha Wilson Costellow, Albert L. Gregory, William G. Martin, John Allen Owens. Index to "A Tour of a Three Mule Town"
Dinner at Daddy Deck's, by James S. Golden, Jr.
Daddy Deck's Father, by James S. Golden, Jr.
Bim and Bull, the Yoke of Oxen that Gave Us the Name "Bimble"
The Dishman Family, written by William M. Dishman, Jr. Congressman Caleb Powers arguing for funding for a post office and mine rescue station in Barbourville, Kentucky by Douglas Bargo. The article focuses on coal and prosperity. Large photo of Governor Flem D. Sampson during the Barbourville Horse Exposition at the Minton Fairgrounds, 20 July 1928. Article and photo about new signs drawing attention to Big and Little Richland Creeks in Knox County, Kentucky.